Home » I did a social media cleanse for three weeks, then I binged for Mardi Gras. Here’s how my attitude changed. 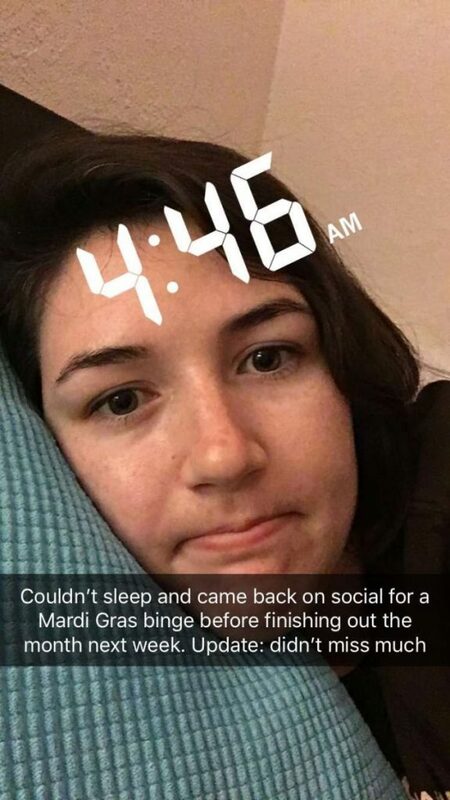 I did a social media cleanse for three weeks, then I binged for Mardi Gras. Here’s how my attitude changed. Eighty one notifications. I was off social media for just three weeks, and on Facebook alone, there were 81 notifications calling for me to click on that little red bubble. Three weeks ago, I committed to doing a social media cleanse for a month. I deleted all of the apps, but not the accounts, and only clicked on the websites for work purposes – checking names for news articles, embedding tweets in stories (and once to get a dollar off on a sweatshirt by liking the Rathskeller on Facebook, gotta hustle). At the suggestion of the staff of The Miami Hurricane, whose members kept me accountable on this cleanse, I’m breaking my commitment in two parts. First, do a one-day-only social media binge on Fat Tuesday before the full month is over. Second, go back off for a final 10 days of reflection. Thirty minutes after that moment I opened Facebook, I was done with all of those 81 notifications, plus my notifications from every other platform. And I was extremely disappointed. Apparently when a user goes off Facebook or Twitter, the platform tries to draw them back in by sending a bunch of meaningless notifications that wouldn’t normally show up. The vast majority of my notifications were people posting in groups I don’t use or needy reminders I wouldn’t normally get, like “Friend X just posted a status update,” or “Friend Y shared a link.” I just don’t care about what Tasty video my third cousin is planning to recreate for the Super Bowl or the thirst trap someone from my freshman-year floor posted. The real interactions I had missed were limited. My fear of missing out was primarily driven by missing event invites. There were eight event invites I had missed on Facebook, but I knew of all of them from friends texting or telling me in real life. And that’s the thing. The relationships I care about most continued outside of social media. It’s always nice for friends to tag me in memes, but they still know how to make me laugh in texts and in person, they still invite me to their parties and they still care about me without a bubble on their phone reminding them I exist. In fact, today wasn’t much of a binge at all. I caught up on my notifications, but after those from the first couple days of the cleanse, most of them were meaningless. I opened Snapchat a few more times because it can replace texting. But other than that, I never felt the impulse to scroll. In the upcoming final days of the cleanse, I’m going to seriously reflect on how to bring these platforms back into my life in a way that benefits me, not just the data miners that are making millions on my personal information. Stay tuned. Note: I did not technically give up LinkedIn, but I also did not go on LinkedIn once in three weeks. I’m going speed dating in Wynwood tonight and will write about that social experiment, too, but I may need to check out my dates on LinkedIn after they try to convince me “Bitcoin investor” is a real job. Annie Cappetta is a senior studying political science and ecosystem science and policy. She is the managing editor of The Miami Hurricane.